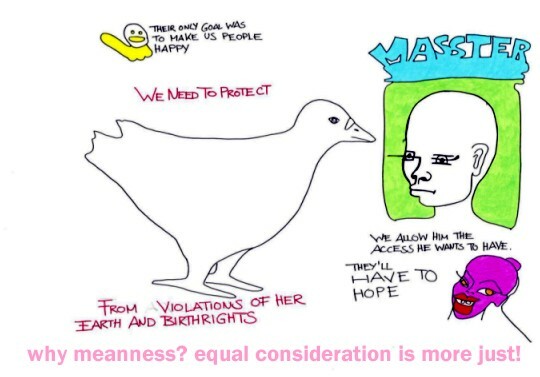 Speciesism: Playing judge and jury about how each species should be treated. Putting oneself in the position to dictate the rights of all species. Having the opinion that humans are the superior species. What would be a crucial point at which it would be clear that someone is not a speciesist? I would think not consuming animal derived food products would be the main point. That would be an action that would at least make the likely possibility that one might not be a speciesist clear. Because if one did eat/use animal derived stuff, they coudn't not be a speciesist. How would you say does a speciesist function in her/his thoughts, if put into a sentence? A being entitled to feed on all that can be fed on at their preference. What role does eating meat play to people do you think? Being the most powerful and bonding with all other humans by doing it. Could one speak of a conspiracy system against different-than-human animals? Sure. There are all kinds of twisted lies to perpetuate the killing/enslaving and controlling of all noh-humans. Is there anything you find the biggest lie? That God put the animals on earth for man to use. That the animals are here for man to use - their purpose is to be used by man, otherwise they wouldn't even exist. It's the most dangerous lie, cause it makes people who might otherwise find animal exploitation wrong accept it. Do you think people created a superior being such as god on purpose to say this? Probably. And also to vistimize other races of humans even, so yes, certainly to victimize the animals. What do you think is the worst dilemma about the whole issue, if you can think of one? Man's selfishness is so attractive to man, that it continues in a powerful cycle. People make a big fuss about humanity, or caring for their families, etc. Why do you think are people selfish when it comes down to nonhuman animals? Cause they can't control the animals. With humans, they have some control over fellow humans. Humans always want to be entertained. Animals don't want to participate in humans crappy "play", so they are hated and forced to participate. Humans have a disturbed perception of what life is about and they hate any life that won't participate in it. When they see a butterfly and enjoy watching it, they think the butterfly is participating, but it's not, just sometimes the animals accidently participate without being forced to. Entertainment for humans is the center of it all and eating is entertainment for humans.